Synonymous with vitamin C, citrus fruits are at the top of list. Grapefruit, one of the family members, is my muse currently. Grapefruit offers many benefits for your health (and some cautions as well). Some claim it to be the ‘forbidden fruit’ while some urge you to have it in all your meals. To eat or not to eat – we’ll let you decide for yourself after reading this extensive piece. Brace yourself and scroll down! How Different Is Grapefruit From Other Citrus Fruits? Why Is It Popular? Due to its horde of applications! What Health Benefits Does Grapefruit Have? How Can It Give You A Fit Body? What Are The Risks/Adverse Effects Of Having Grapefruit? Grapefruit (Citrus X paradisi) is an ‘accidental’ hybrid between the pummelo and the orange. It was referred to as the ‘forbidden fruit’ by many botanists and enthusiasts. It was grown in most parts of Jamaica, Florida, and California initially. Later, grapefruit plantations were set up in Mexico, Argentina, Cyprus, Morocco, and some areas of South America (1). Grapefruit is nearly round, thick, pale-lemon colored or blushed with pink skins. It has a white, spongy, and bitter inside that looks pale-yellow, nearly whitish, pink, or deep red (1). You can find seedless and seeded varieties of this fruit. Unlike those of the pummelo, grapefruit seeds are usually polyembryonic. The number of fruits in a cluster varies greatly; a dozen is unusual, but there have been as many as 20! Hence, the name ‘grape’fruit (1). Grapefruit is eaten at breakfast and supper – in salads, appetizers, desserts, marmalades, and jellies. Grapefruit juice (fresh, chilled, canned, dehydrated, or powdered) is loved by many. You can also make wine and vinegar from this – but it needs a lot of care (1). Grapefruit peel is an important source of pectin. It is used in the form of candies to preserve other fruits. The peel oil (processed, distilled) is commonly used in soft drink flavoring (1). Grapefruit seed oil is super bitter and dark. It is refined to smell like olive oil and can be used similarly. Grapefruit is packed with macro and micronutrients. Thus, eating it in small portions can make you fit as a fiddle. Want to know which organs of your body this fruit affects the most? Read on! There is evidence showing the carcinogenic effect of increasing photoexposure. 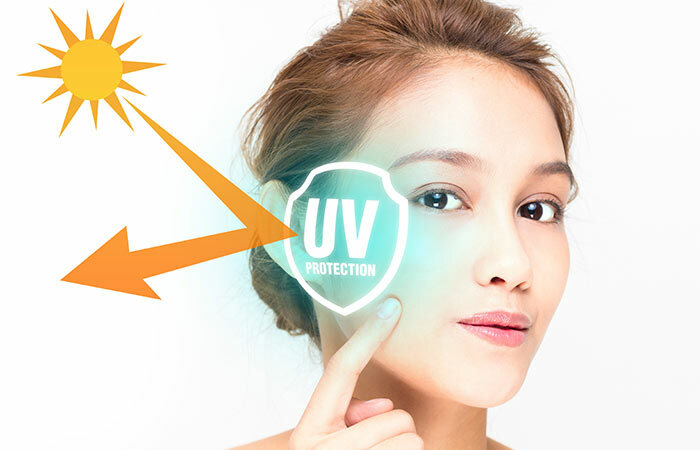 The UVA and UVB rays from sunlight can cause immunosuppression, leading to DNA damage – and ultimately skin cancers (2). Citrus fruits, including grapefruit, can prevent your skin from becoming photosensitive. Grapefruit has phenolic acids, flavonoids, and potent polyphenols that have antioxidant and anti-inflammatory effects on your skin. They eliminate the free radicals, block the anti-inflammatory compounds, delay the development of sunburn or redness (erythema) on your skin, and improve skin stiffness and elasticity (2). However, excessive consumption of grapefruit (and citrus fruits) has been linked to photosensitivity and carcinogenicity. Blame the phytochemicals (3), (4)! Grapefruit is no good as a weight loss supplement. – A 2018 study done at the University of Oxford, UK says there was no significant reduction in weight between control and test groups (5). – There is a need for further research-backed clarity in this regard. Eating the whole grapefruit is considered healthier than drinking its juice. Commonly grown cultivars of grapefruit have interesting names. These include Duncan, Foster, Marsh, Oroblanco, Sweetie, Paradise Navel, Redblush, Star Ruby, Thomson, Triumph, Melogold, etc. (1). Grapefruit juice can improve glucose intolerance in diabetic rats, according to research (6). It has no impact on insulin production or secretion. But, this juice can elevate glucokinase enzyme activity – leading to rapid glucose metabolism (6). Some studies claim that grapefruit juice can reduce body weight in obese/overweight diabetic mouse models. The evidence remains inconclusive at this time (7). Interestingly, grapefruit juice increases metformin accumulation in diabetic patients. The metformin levels in a diabetic’s liver were found to be higher than the controls (8). Our liver and intestinal wall contain some special enzyme systems, like the CYP (cytochrome P 450) system. The enzymes of this family are involved in the biotransformation of various endogenous and exogenous compounds. Many drugs we take orally are broken down by the CYP system in the liver and sent into circulation (9). But since they are broken down by the CYP system, less amount of the drugs might get into the bloodstream. Grapefruit juice can inhibit this CYP system. In such a case, the orally consumed drugs are bound to be more bioavailable in the circulation. There is almost a 47% drop in the CYP3A4 enzyme level within 4 hours of grapefruit juice ingestion (200-300 ml) (9), (10)! 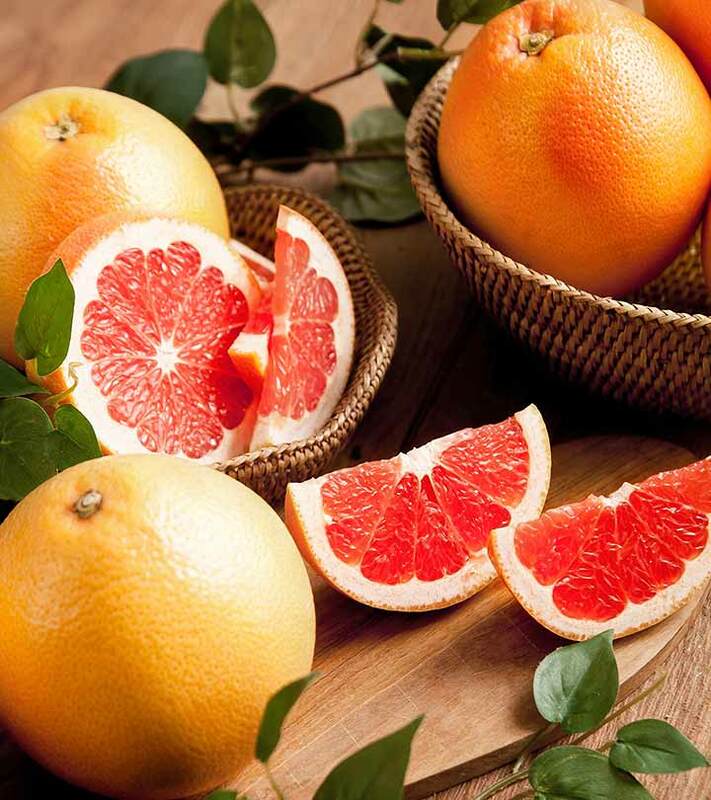 Drinking grapefruit juice could enhance the serum concentration of several orally-taken drugs – antimicrobials, chemotherapeutics, antihistamines, anticholesterolemic, cardiovascular, antihypertensive, etc. This citrus fruit has high levels of pectin, a soluble fiber known for its anti-hyperlipidemic activity. Naringin is another important phytochemical present in grapefruit. Along with giving the fruit its characteristic bitter taste, naringin has potent lipid-lowering and antioxidant properties (11). Naringin is said to lower cholesterol by preventing HMG-CoA reductase enzyme activity. A 2016 study showed that a 0.3 ml/kg dose of grapefruit could increase the HDL (good cholesterol) levels (11). This lipid-lowering activity is attributed to the antioxidant activity of grapefruit phytochemicals. These flavonoids and polyphenols prevent the oxidation of LDL (bad cholesterol), inhibit the uptake of oxidized LDL by macrophages (specialized cells), and curb the aggregation of oxidized LDL (11). Hence, grapefruit, like other citrus fruits, has anti-atherosclerotic properties too. In several rat studies, grapefruit juice demonstrated stimulatory effects on liver enzymes. 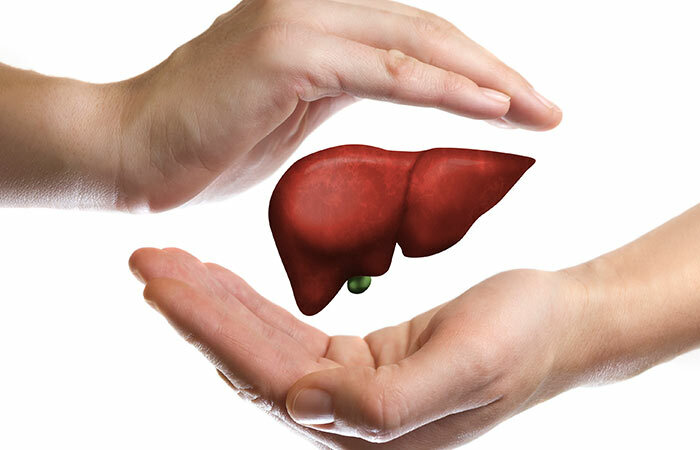 These enzymes keep the liver safe from inflammation that is caused due to lipid peroxidation and accumulation (12). Chronic consumption of this citrus juice increased the levels of antioxidant enzymes, including catalase (CAT), xanthine oxidase (XOD), peroxidase (Px), lipid peroxidase (LPx), and glutathione peroxidase (GSH-Px) (12). Citrus fruit oil was reported to improve hepatotoxicity, according to another study performed on chicken. The citrus oils can reduce the lesions and inflammation of the liver induced by carcinogens. Their biochemicals can mitigate liver hyperplasia and cancers too (13). One cup (230 g) of raw grapefruit section with juice and pulp has about 3.7 g of dietary fiber (14). This fiber restores the balance of the gut microbiota – like other prebiotic foods. Grapefruit contains a fair amount of soluble fibers like pectin and insoluble fiber like lignin, along with vitamin C and potassium. These molecules act as laxatives and increase the water weight of the stool formed. This way, the stools pass through the excretory system easily – thus preventing constipation and colon cancers (15). Since fiber is digested slower than carbohydrates or fats, such fruits give you a sense of satiety. As it keeps you from mindless eating, grapefruit might be associated with body weight control. Increasing one’s intake of grapefruit along with other citrus fruits might reduce inflammation and associated diseases, particularly cardiovascular diseases. These fruits are high in flavonoids that exert potent antioxidant and anti-inflammatory effects (16). Moreover, in rat studies, it was observed that grapefruit juice could boost the anti-inflammatory effect of drugs like Diclofenac, when taken together (17). It is noteworthy that 1 cup (230 g) of grapefruit sections (with juice) has about 71.8 mg of vitamin C (14)! This vitamin helps your body in making antibodies and specialized cells to up your immunity game (18). While vitamin C is known to boost your immunity, its supplementation does not necessarily prevent bouts of the common cold. All it could do is, perhaps, to reduce the severity and duration of the infection. The maximum effect of vitamin C against flu was reported when its supplementation (about 8 g/day) started within 24 hours of the symptom onset. And this therapy was continued for 5 days. What you need to remember is – vitamin C can indeed help you deal with the common cold/flu. But, there is inconclusive evidence to prove if it can ‘prevent’ this infection (19). Whether it prevents cold or not, grapefruit still makes it to my grocery list. 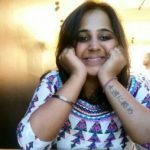 If I am going to get all these benefits just by eating one fruit, why not? 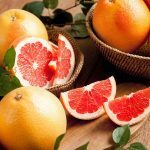 If you are still not convinced to pick up grapefruit, let me give you some insight into its nutritional profile. Along with vitamins C and A, potassium, calcium, phosphorus, and folate, grapefruit contains several flavonoids in abundance. Naringin, naringenin, hesperidin, didymin, neohesperidin, poncirin, apigenin, kaempferol, isorhoifolin, myricetin, diosmin, luteolin, quercetin, rutin, neodiosimin, tangeritin, nobiletin, and rhoifolin are a few characterized ones (20). ß-carotene, lycopene, ζ-carotene, phytofluene, zeaxanthin, and β-cryptoxanthin are some commonly found carotenoids in this citrus fruit (21). Citric acid was the most abundant organic acid, followed by quininic acid (22). The predominant monoterpenes and sesquiterpenes are limonene, caryophyllene, α-humulene, humulen-(v1), and β-linalool (22). However, these phytochemicals vary in occurrence, concentration, and bioavailability across cultivars. Woah! That is an explosive profile, isn’t it? Now, if I asked you if you would like to eat some grapefruit, I’m sure you would jump at it. Here are a few ways to enjoy this fruit. Super-refreshing Snack: You can add sliced bananas, slices of grapefruit, and some nuts to low-fat yogurt. That’s your refreshing and filling snack on-the-go! Salad Dressing: Blend some grapefruit chunks with equal (or lesser) parts of olive oil and vinegar. This is going to be that zesty salad dressing you were in search all along! Alternatively, you can toss some peeled grapefruit chunks into your salad to vive your boring lunch some zing. Grapefruit Popsicle: Freeze 100% grapefruit juice in a popsicle mold. Enjoy it on a sunny afternoon. Grapefruit: You can relish juicy and fresh grapefruit all round the year or try its close cousins like pummelos, kumquats, mandarins, tangerines, and oranges for a fresh dose of health and wellness. Grapefruit sounds like an ideal personal medical assistant, doesn’t it? Be sure to pick a few of them from the mart this time. While you are at it, keep the following points in mind. Pick the grapefruits that have smooth, glossy skin. A grapefruit should feel heavy for its size when you pick it. Check for brown or soft/mushy spots on the fruits. You should be able to store grapefruits for a week at room temperature (18°C-25°C) (23). Remember you have three main types in grapefruit: white/yellow, pink, and red. A half portion of a medium grapefruit provides 100% daily value of vitamin C, 8% dietary fiber, 35% vitamin A, and about 5% potassium, folate, calcium, magnesium, and vitamin-B complex (24). Hence, eating a cup (or half) of grapefruit segments might keep you fit and detoxed. But, there are certain apprehensions the medical community has cited about grapefruits. You should know more about them before you get home a box. Grapefruit juice inhibits the activity of intestinal cytochrome P450 3A4 (CYP3A4) enzyme system. Its components, furanocoumarins, might be responsible for this block. This inhibition leads to an elevated serum level of orally administered drugs (25). For instance, when estrogen was orally administered along with grapefruit intake, there was a spike in endogenous estrogen levels. Increased estrogen levels might be responsible for the onset of breast cancer in women (25). Not all drugs face this problem. Only those that are taken by mouth, have low to intermediate oral bioavailability, and metabolized by CYP450 3A4 (26). Amiodarone, Verapamil, Atorvastatin, Simvastatin, Tacrolimus, Colchicine, Ethinylestradiol are a few drugs that have been documented to have adverse effects when taken with grapefruit (26). Compounds called psoralens make your skin sensitive when exposed to sunlight. Unfortunately, psoralens are abundant in many citrus fruits. Researchers at the Alpert Medical School of Brown University and Rhode Island Hospital studied the effect of grapefruit juice consumption on 10,000 white men and women (3). Psoralens was associated with a higher risk of malignant melanoma. Those who consumed citrus fruits 1.6 or more times per day had a 33% higher risk compared to those who consumed <2 times per week (3). This is still not entirely proven yet – further research can only explain the mechanism behind this sensitivity. Eating too much grapefruit can lead to an overdose of vitamin C. An overdose of vitamin C can cause symptoms such as nausea, diarrhea, belching, abdominal cramps, and calcification in kidneys (kidney stones) (27). Does that mean you should stay away from grapefruits? Well, not really. Timing it right should solve the problem. Grapefruit is a reservoir of vitamin C and potassium – the micronutrients we need the most. This citrus fruit can give you glowing skin, a clean tummy, a healthy liver, and strong immunity. But keep the drug interactions in mind. Do not consume grapefruit/juice if your doctor advises you against it. You can ask for medication that doesn’t interfere with the citrus furanocoumarins. If you have any questions, suggestions, and comments regarding this read, write to us in the box below. Bring home a burst of health and fitness with grapefruit! “Grapefruit” NewCROP™, Center for New Crops & Plant Products, Purdue University. “Skin photoprotective and antiageing effects…” Food & Nutrition Research, US National Library of Medicine. “Eat a lot of citrus?…” News from Brown, Brown University. “Citrus consumption and risk of basal cell carcinoma…” Carcinogenesis, US National Library of Medicine. “Does eating grapefruit help you lose weight?” News Bites, Healthy & Nutrition Letter, Tufts University Friedman School of Nutrition Science and Policy. “Grapefruit juice improves glucose intolerance in…” European Journal of Nutrition, US National Library of Medicine. “Consumption of Clarified Grapefruit Juice…” PLoS One, US National Library of Medicine. “Grapefruit juice improves glycemic control but…” Methods and Findings in Experimental and Clinical Pharmacology, US National Library of Medicine. “Interactions between grapefruit juice and…” American Journal of Cardiovascular Drugs, US National Library of Medicine. “Antihyperlipidemic effects of Citrus sinensis, Citrus…” Journal of Pharmacy and BioAllied Sciences, US National Library of Medicine. “The activity of liver oxidative enzymes after…” Experimental and Toxicologic Pathology, US National Library of Medicine. “Plant Consumption and Liver Health” Evidence-based Complementary and Alternative Medicine, US National Library of Medicine. “Full Report (All Nutrients): 09112, Grapefruit…” Food Search, National Nutrient Database for Standard Reference Legacy Release, Agricultural Research Service, United States Department of Agriculture. “Daily Consumption of Grapefruit for 6 weeks Reduces…” The Journal of Nutrition, US National Library of Medicine. “Grapefruit juice potentiates the anti-inflammatory…” Pharmacological Research, US National Library of Medicine. “Nourish Your Immune System” NDSU Extension Service. “Vitamin C in the Prevention and Treatment…” American Journal of Lifestyle Medicine. “Flavonoids in Grapefruit and Commercial Grapefruit…” Florida State Horticultural Society. “Carotenoids in Grapefruit, Citrus paradisi” Brief Papers, Plant Physiology, Department of Food Technology, University of California. “Determination of sugars, organic acids, aroma components, and…” Food Chemistry, US National Library of Medicine. “Harvest of the Month” Network for a Healthy California, Champions for Change, California Department of Public Health. “Consumption of grapefruit is associated with higher nutrient…” Food And Nutrition Research, US National Library of Medicine. “The Effect of Grapefruit Intake on Endogenous…” HHS Public Access, Author Manuscript, Us National Library of Medicine. “Grapefruit-medication interactions: Forbidden…” Canadian Medical Association Journal, US National Library of Medicine. “Appendix C: Nutrient Chart- Function…” Infant Nutrition and Feeding, WIC Works Resource System.